I'm Not Skinny: My nails have decided it's Spring. My nails have decided it's Spring. I need some sunshine and warm sun. The winter really steals the life from me. That's why I've started my Spring nail art early. 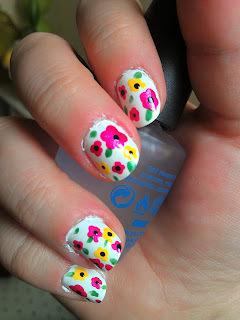 I did flowers this week, super simple blooms on white polish. Just enough to make me think of warmer days and bring a smile to my face. 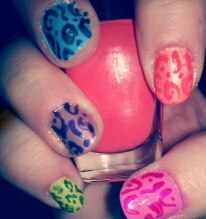 Last week I went with doodles on bright colors. I was surprised at how much I liked it and how many people commented on them. What are your plans for Springtime nail art? Any nail colors/polishes you're ready to pull out?